Ahoy mateys! 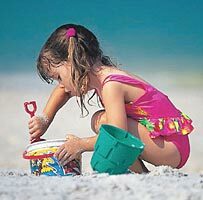 Welcome to the second edition of “Florida with Kids” series centering on the best Florida family beaches and Florida beach vacations. If you missed the first post, check out “Florida with Kids: Siesta Beach”, it’s a diamond of a gem in the Florida family beach vacation treasure chest. Treasure Island is no slouch on the Florida family beach vacation list either. This little three mile islet nestled between St. Pete Beach -which is just south of Treasure Island on Gulf Blvd. (a.k.a. SR 699) and Madeira Beach -just north of Treasure Island on Gulf Blvd. isn’t marketed as the “Treasure of the Gulf Coast” and “A Jewel of the Gulf Beaches” for nothing. Treasure Island’s beauty isn’t exaggerated one bit, which is one reason it sits at #2 on my list of the best “Florida with Kids” family beach vacations, filled with more fun for pirates, kids, tweens, toddlers, adults; all sea and land lubbers alike. Treasure Island Beach Access: Gulf Blvd & 104th Ave., Treasure Island, St. Petersburg, FL 33706. The main Florida family beach on Treasure Island, where everyone goes to enjoy the white sand, family friendly amenities and fun in the sun. Treasure Island Beach Access Virtual Tour. Treasure Island Municipal Beach Playground is a kid friendly park located at Gulf Blvd & 112th Ave. B, Treasure Island, FL 33706, ph. (727) 360-3278. It’s basically a small playground directly on the beach that’s open from 7am to 7pm. Fun Center Treasure Island Florida -103 104th Ave. Treasure Island, St. Petersburg, FL 33706- ph. (727) 360-3003. If by chance, you get tired of all the sand and family beach fun, you can always grab the kids and head to the Fun Center of Treasure Island, it’s a large arcade / amusement center with acres of arcade games and all sorts of fun for kids (and adults) including over 160 arcade games and others like skee-ball, air hockey, pinball, and even pool tables. Now doesn’t that make going to Florida with kids sound like fun? Pirate Ship-John’s Pass– 140 Boardwalk Pl W., Madeira Beach, FL 33708-2692. The Pirate Ship to see at John’s Pass, all your little land lubbers will love this, with family fun cruises, treasure hunts, water gun battles, pirate face painting, pirate stories, limbo and a swashbuckling dance party. “Yes ya’ scurvy dogs, they are a real pirate ship that cruises through the waters of Treasure Island and Boca Ciega Bay (also best place to catch sight of some dolphins), and returns you to the village of Johns Pass”. If that doesn’t make you want to grab your suitcase and head to Florida with the kids, I don’t know what will! Smugglers Cove Adventure Golf-15395 Gulf Blvd., Madeira Beach, FL 33708-More great family fun, play miniature golf and more. OLD TIME PHOTOS, John’s Pass Village; adventure museum-type fun, something interesting for everyone. Parrots of the Caribbean-146 Boardwalk Pl E., Madeira Beach, FL 33708- Trolley boat tour adventures. Crazy fun for the whole family. Host Dolphin Tours-557 Crystal Dr., Madeira Beach, FL 33708-2363- Guided boat tour, see dolphins! The Floridian-230 107th Avenue, Treasure Island, Florida- Best Cuban Sandwich around. Beach Snoballs -10927 Gulf Blvd. Treasure Island, FL 33706 ph; (727) 415-8326 – call them snocones or shaved ice, these treats are delicious! Sloppy Joe’s-10650Gulf Blvd., Treasure Island, Florida-Beachfront food and drink. Smoking area available. Wahoo’s Bar and Grill– (727) 290-9856, 149 107th Ave.,Treasure Island, FL 33706-Good sea food at reasonable prices. Full liquor bar, Happy Hour. Ricky T’s Bar and Grille-10601 Gulf Blvd., Treasure Island, Fl. 33706-Where the local’s go for food and drink. Smoking area available. Caddy’s Waterfront – ph; (727) 360-4993 – 9000 W Gulf Blvd., Treasure Island, FL 33706-Classic Florida Beach Bar and Grill. Smoking area available. Gator’s Cafe & Saloon-12754 Kingfish Dr., Treasure Island, Florida-live music. Captain Kosmakos Seafood House (727) 367-3743 – 9610 Gulf Blvd.,Treasure Island, FL 33706-Seafood and Steaks. Happy Hour 7 days a week. If you’ve stayed or visited on or near Treasure Island Beach in St. Petersburg, Florida for your Florida Family Beach Vacation, leave me a comment about it, I’d love to hear about your family friendly swashbuckling adventures! And stay tuned for more of the “Florida with Kids” series. « Florida With Kids: Check out Siesta Beach Florida! We love visiting St. Pete every year. We did the pirate adventure a couple years back and the kids loved it!!! Ka’Tiki (listed above as a family-friendly restaurant) is a bar that only allows ages 21 and up.